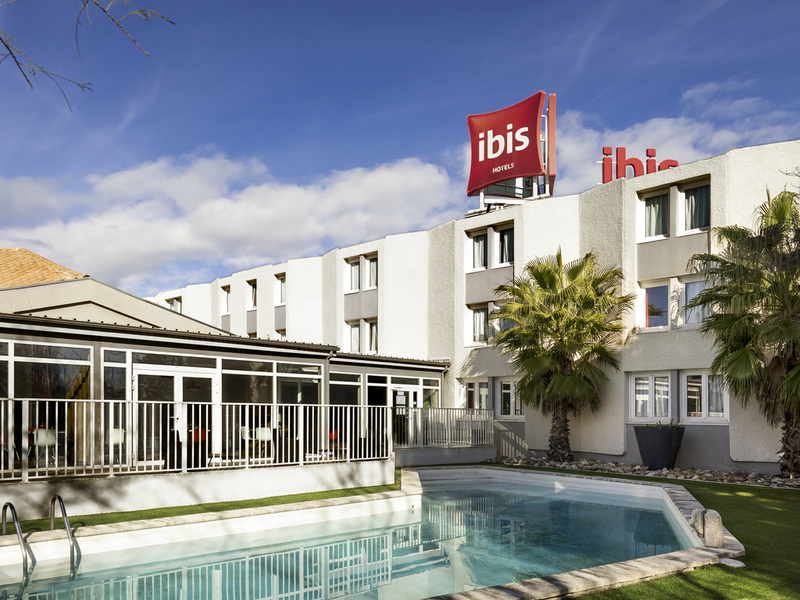 The ibis Arles hotel is a short drive away from the Camargue, Alpilles and Baux-de-Provence regions. Located 1,500 m from the Arènes and the historic centre, it is reached easily and directly from the A54 or N113. It has 91 air-conditioned and soundproofe d rooms, a restaurant, a bar open 24/24, a swimming pool, a terrace, free closed parking, 2 meeting rooms for conferences and seminars and Wifi Internet access. There is a tennis club 800 m from the hotel. 1640 yards from the center (Arènes) of the little Rome of Gaul. Follow in the footsteps of Vincent Van Gogh. Discover the wild Camargue or the Provencal Alpilles: Baux de Provence, St-Rémy-de-Provence. + Bed,Shower,Breakfast (Including fresh ground coffee),€70 including breakfast=OK,Staff Friendly. - Rooms very small,Rooms a bit out dated,TV no English. Room cleanness, restaurant, hotel position, service, personnel, all was very good. Only issue that I could lament is service for payment with credit cards. I found that it fails frequently with VISA and/or Master card, regardless. Several times cards were rejected even though all was OK with them. I've even double checked with the bank, and according to rejected transaction reports, cards provider concluded that rejections were due to unreliable communication between POS and banks. It would be therefore good if somehow this glitch get attended and fixed. Best regards Zoran M.
No frills, nothing to complain about except the lack of fresh coffee, instant does not count! A good standard Ibis with a lovely breakfast and pool.Staff friendly and helpful.Welcome drink(s) good, and bar service spot on.Large free car park.Easy walking distance to KFC / Mcd and a LidiEnjoyed our stay and will return if in area. The hotel and pool and carpark are all great, plus the staff are excellent. Not far to the old city by foot or drive as parking is easy. We enjoyed our stay immensely. This is the third time we visit this hotel in the last years (always during the rencontres), upon arrival (pre-paid and booked at the accorhotels site) we were told that breakfast was not includedin our booking... showing our reservation where it was clearly stated this solved that problem. As silver member, we didn't get our welcome drink voucher (not that we felt very welcome at all so that matches the experience). Breakfast, bed and bar/restaurant staff are all very competent, friendly and service minded. No complaints at all, but the rooms... they really need a general overhaul asap (the elevator installation was a nice start, but it seems that was all being renovated), rooms have dirty carpets, stains on all walls, screws and nails sticking out from bedside lamps, wall etc. Cracks on the desk, in general worth 1 star maximum. Asking for a late checkout (again, as silver member) was possible until 1.00 pm as the hotel was quite full. Not a real late checkout but full is full so understandable. Too bad, that when checking that I was able to book at least 3 rooms for the same day arrival so full is not-so-full but we decided anyway to leave earlier instead of discussing this anymore. Upon checkout: wrong bar charges... no surprise as the person manning the bar at night just makes notes and apparently they enter charges the next day.. with errors. After this was solved we left... the night before our stay we stayed in the Ibis Budget/Styles Palais de Congres in Arles as this Ibis had to place.. to be honest: it's much better with reception staff more competent. I ma happy that all our Accorhotel experiences in general are good and that this is an exception, but management should make changes. This was our first trip to Arles so fist time we stayed at this hotel. As usual for an IBIS the hotel was very welcoming and the room was clean and tidy with a new comfortable bed. Food was good and well priced and even though we did not use it had a clean and tidy outdoor area with swimming pool. Only criticism was the walk to the centre of Alres from the hotel was a long way especially as the temperature was very high. All of the staff at the hotel were helpful and friendly from check-in to dining to the housekeeping. The Room was very nice and clean, staff were helpful. We choose IBIS hotels because we know what we are going to get, a nice room and bed. We had a meal in the restaurant as we arrived late and the menu was ok for me but my wife is vegatarian but eats fish and there was hardly anything she could eat and ended up with two starters as a main meal, so i think the menu needs looking at for a more wider choice. The room facilities were quite acceptable. Unfortunately, the restaurant was not so good. Only one vegetarian starter choice and no main vegetarian course. Service was extremely slow (30 minutes wait from main course to dessert) though here was only one member of staff who was working hard to keep up. Breakfast was confusing with items in different places needing a search to find them. Not as good as it could have been. First of all the room was so small there was not room for a suitcase of any size. We were unable to sleep because our room was full of mosquitoes. At 1.30 am we asked reception for some fly spray but none was available. We were told that as we were in the Camargue we had to expect a lot of mosquitoes, but much could be done to help. Fly screens at the window or even just a net curtain would certainly help. We were given some insect repellent to use which may have helped a bit. Reception was problem-free, room was perfectly acceptable. Unfortunately, a large group using the restaurant at the same time as us meant that our food was delayed and cold when it arrived. My meal had to be returned to be reheated, though, even then, it was not as it should be. My wife's was lukewarm. Not the standard that we have come to expect at this hotel. From check in to check out the staff were friendly efficient and went out of their way to ensure our stay was a good one. Public areas were smart, welcoming, the outside pool area looked good, tempting us out there but time was short do we didn't get the opportunity to try it. The bedroom areas were tired and badly in need of refreshing. The room was smallish but adequate for our overnight stay. We booked the inclusive dinner bed and breakfast package as we were driving long distances and were very pleased with both dinner and breakfast. Loved the idea that I could cook my boiled eggs myself so I got them just right! Close to the city centre and even closer to supermarkets. I am a full time traveler and have been through Asia, Europe, North &amp; Central America. I prefer 2-3* hotels and have stayed in Ibis hotels on most of these continents. I travel with my pet (chihuahua) and it's been my &quot;go to&quot; brand not only because most properties allow pets but also because it offers a predictable standard of accomodation: not luxurious, but usually modern and comfortable, and located near but not inside the busy districts of cities. Suits me perfectly. This property fell below that standard on many levels. It was an old building that needs updating, a new coat of paint and more thorough cleaning at a minimum (carpets were threadbare &amp; stained in hallways and there were cobwebs hanging in corners). The rooms were too small and not well equipped (not enough space for bags, no mini fridge, no hand towels). The pool was small and dirty. Dinner was the saving grace, both for food quality and service. We had the menu of the day and found it tasty and great value. Breakfast was less impressive, with an egg machine that didn't work properly and fruit past it's best date. Front desk service needs improvement. We asked for a bucket of ice, a fairly standard item in a motel, and were met initially with unsmiling silence. Assuming language was a barrier, I started to describe what I wanted to which I was curtly cut off with, &quot;I know what it is. You can ask for ice at the bar&quot; (which was directly adjacent!). When I said I needed a bucket to put the ice in also, he said &quot;we don't have that&quot;. Ok then. Several other ordinary enquiries received the same level of response. The location is further from downtown than indicated on the website and in a less than appealing location at the nexus of several highways and amidst car repair facilities and box stores. This was the most expensive and least appealing Ibis I have ever stayed in. For the money, there are many better choices in Arles. I booked a room in September 2016 for 5 nights on Accor website. On checking in the staff informed my Accor silver meant nothing! They pushed for me to buy a 90 euro business card. I was charged the walkin rate and not members rate. Room horrible, full of mosquitoes. Hair drier would not turn off. Staff fixed with sticky tape. Wall lights appeared to have scorched marks on ceiling. The bed side lamp shades were broken. The bath tub floor loose. Grab handle for bath too high almost on ceiling. One PowerPoint for the room, the TV deposited on the desk leaving little room to work. My foyer near lift had food scraps for 3 days. The dining room has a trip fall hazard. Security car park gate does not open as instructed and the car park and gardens in very poor state. This hotel needs proper management, repairs and staff trained to professional standard. Really nice hotel within walking distance of centre of Arles (20 min) or short bus ride (bus stop around corner from hotel). Visited 3 years ago and the hotel has benefitted from refurbishment if pool area & new lift up to guest rooms. Rooms as usual excellent but disappointng restaurant . The accommodation was very good. I stayed at the hotel a few years ago and found the restaurant in the evening to be excellent. This time it was very disappointing. The choice was limited and the option of a starter/ dessert + main dish offered no choice at all. Also prices have gone up considerably. We found the nearby Campanile offered a greater choice for a lower cost and was much better value.